I know that I said I was going to post a comparison of the cheap watercolors to the new ones that I bought over the weekend. But my artistic direction was taking me elsewhere. A couple of weeks ago I decided to by myself a birthday present. 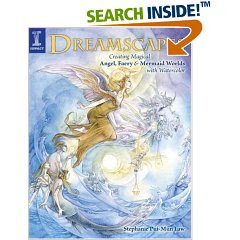 It was a book on watercolor fairies called Dreamscapes: Creating Magical Angel, Faery & Mermaid Worlds In Watercolor. Here is a link to the Amazon page for it. Well, the book as some wonderful projects and they start out rather small and move up in detail quickly. I decided to start basically at the first real project. 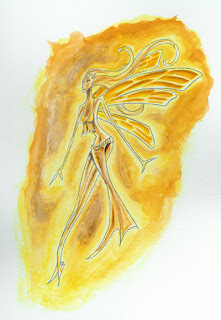 It was to create a glowing pixie. After a bit of trial and error I came up with something I like well enough. It isn't as perfect as I would have liked, but I have learned a great deal during the process. So, here it is, for better or worse.